In December, the Japanese Centre of International Theatre Institute will present a staged reading of a play by Ghannam Ghannam. Ahead of this, the writer will visit Japan to discuss contemporary Arab theatre and the work of the Arab Theatre Institute, including the Arab Theatre Festival that marks its tenth year in 2018. Born in Jericho in 1955. He started his work in the theatre in 1984. 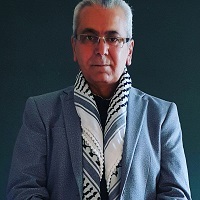 He is a member of the Jordan Artist Guild and Jordan Theatre People Association as well as a founding member of the Arab Theatre Institute (ATI) and other important theatre groups. He also works as a jury member for various theatre festivals and as the publishing and media manager for ATI. As a playwright and director, he has won many important prizes, including the Creative Prize from the Department of Cultural Affairs, Jordan, for “Lilac Duhaa (Death in the Era of Daish)” (2016). His work includes “Return to Haifa,” a monodrama based on the novel by Ghassan Kanafani. His latest play is “I will die in exile” (2017). F/T Talks is a series of discussions helping audiences learn more about the performances and events in the festival. Join “Toky Toki Saru” director Pichet Klunchun to discuss the process behind creating his unique new dance work for Festival/Tokyo. This talk features Laura Stasane, a producer with the New Theatre Institute of Latvia, who is in Tokyo as a visiting fellow on The Saison Foundation’s artist-in-residence program. In her talk, Stasane will discuss her work at the New Theatre Institute of Latvia as well as Homo Novus, the largest performing arts festival in the Baltic region, and recent trends in the Latvian performing arts scene. Laura Stasane is a producer and program curator at the New Theatre Institute of Latvia, specializing in contemporary dance. She is involved with Homo Novus, the largest performing arts festival in the Baltic region, as well as the international project Dance Move Cities. As part of the latter, she has produced a work commissioned from the Japanese group contact Gonzo. She has also invited Heine Avdal and Yukiko Shinozaki in 2015 and 2016, and worked on co-productions with Latvian choreographers and musicians. She has previously visited Japan to attend TPAM in Yokohama in 2011. Exhibits related to the performances and events at F/T17. Open for two weeks during the festival, this information center offers audiences the chance to learn more about F/T17’s events. In addition to the usual Atelier East space inside Tokyo Metropolitan Theatre, this year F/T Station expands over the entire basement floor. Not just information about F/T17, visitors can browse books by the artists in the lineup as well as an archive display of previous festivals. The space will also host a wide range of events related to the main performances, such as talks and screenings. Homes are demolished and the residency rights of Palestinians in Jerusalem are usurped, while elsewhere the “separation wall” encroaches on land and resources, depriving Palestinians of the foundation for building an independent state. In 2014, Festival/Tokyo worked with Al-Kasaba Theatre’s George Ibrahim, who performs the lead role in Einat Weizman’s “Palestine, Year Zero.” Teaming up with the director Yukari Sakata, the dramaturge Kaku Nagashima and visual art unit M√©, “Rashomon | Yabunonaka” was a unique theatrical event inspired by Kurosawa’s film “Rashomon” and Akutagawa’s original short stories with a Middle East twist. This is a screening of video footage of the performance at F/T14.